This lavishly decorated ketubbah, as well as Braginsky Collection Ketubbah 29 (cat. no. 67) produced just six years earlier, represent the height of ketubbah illustration in Ancona. While the art of ketubbah decoration declined in northern Italy during the last decades of the eighteenth century, in central Italy, most prominently in the papal states of Rome and Ancona, it continued to flourish well into the nineteenth century, especially among affluent families. 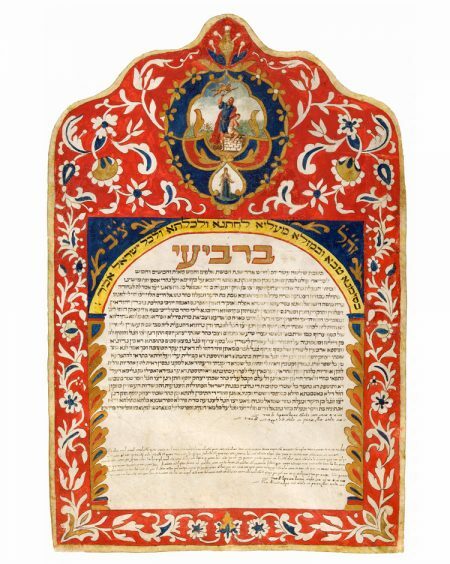 In fact, the bridegroom in this marriage contract is evidently the grandson of his namesake, the noted physician Shabettai Isaac Fiani, who served as rabbi and head of the rabbinical court in Ancona from 1752 to 1770. In an attempt to use the entire skin of the animal, Ancona’s craftsmen decoratively trimmed the area around the animal’s neck, with the contour of the shoulders creating the wavy form seen here at the top. The ornamental border is dominated by large red spaces, upon which floral designs in spared- ground technique appear. The emphasis on large areas of red and blue are typical of ketubbot and megillot from Ancona. The text is centered under an arch supported by a pair of ornamental gilt columns. While arches were commonly used as framing devices in ketubbah decoration since the earliest known ketubbot from the Cairo Genizah, the gold letters inscribed here against the blue spandrels provide an additional meaning. The six square Hebrew letters, an acronym for Psalms 118:20: “This is the gate of the Lord, through which the righteous may enter,” signify that the bridal couple is symbolically passing through the heavenly gate into a sanctified stage in their life. The standard Jewish word for marriage, kiddushim, literally means sanctification. A depiction of the Sacrifice of Isaac, an allusion to the bridegroom whose second name is Isaac, is located in a cartouche at the top center. This scene, a symbol of faithfulness and messianic promise that appears on many Italian ketubbot, has been the most popular biblical story in Jewish art over the ages. The figure beneath, who is more difficult to identify, is perhaps the prophet Samuel, an allusion to the groom’s father.